Eye popping colors - each a miniature work of art. For short sticks or cone incense. Traditional long stick also fits when broke shorter. Collect them, display them, enjoy them. These beautiful porcelain treasures hold stick incense, and portray the many beautiful offerings of the seasons. 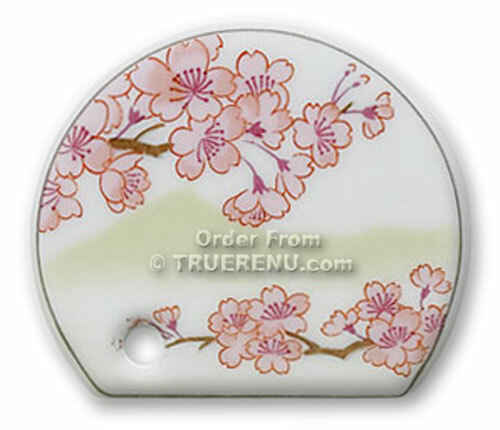 Cherry Blossoms, about 1-5/8" in diameter. Pale pink. Use with a tray or plate to catch ashes. Made in Japan. We like the pure natural fragrance from Shoyeido! About Shoyeido: Shoyeido is a 300 year old, family owned Incense maker in Japan, and one of the few who still practice the traditional method of hand made incense. To create just one fragrance, Shoyeido's master artisans blend anywhere from 20 to 50 herbs and spices together with pure water. Shoyeido does not add a 'support core' to its incense, which means each stick delivers the pure essence of its ingredients without any waste or interference. So do as the Japanese do, and "Listen to Incense". TrueRenu recommends Shoyeido incense for anyone who desires a pure, natural fragrance in his or her environment. Especially recommended for everyone who thinks they don't like incense. If you have encountered incense in the past and found it to be too strong, or too overpowering for you, it was likely due to the use of inferior ingredients, in the wrong ratios, or incorrect heating during manufacturing. We encourage you to try Shoyeido, and discover the amazing effect a high quality incense can have on your environment, and your sense of well being. Insert incense before lighting. Use with a tray or plate to hold ash. The Zen incense fragrances are ideal for meditation and quiet reflection, offering over two hours from each stick. Save with our 3-Pack: 30 sticks each of Sitting, Morning and Evening Zen, each in a traditional rolled bundle.